One of (if not the most) stunning birds I have ever seen, period. It was worth every second of the wait. I was lucky enough to find myself in Boston visiting my girlfriend for the long weekend when Andy Griswold left a message on Saturday about the gull. After composing myself (and waiting for Kim to 'get ready') we rushed up to Gloucester. 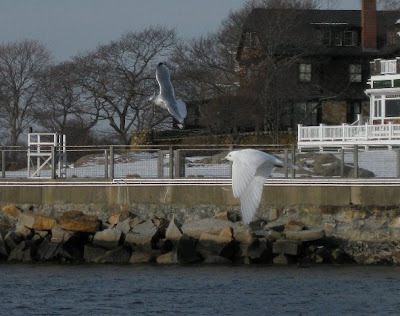 Upon arrival at the small parking lot, the gull was flying (more like floating) around the small cove right next to us. Simply unbelievable. Despite the cold weather we spent the entire afternoon with the bird as it put on a show for us. One day wasn't enough though. 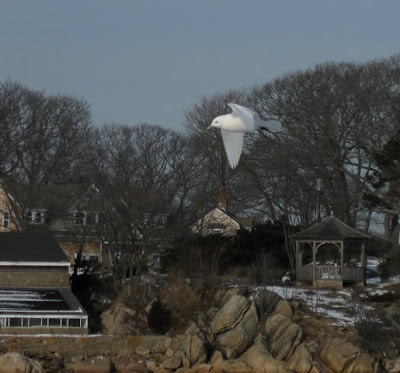 I spent all of today in Gloucester, though a good portion of that time was spent waiting for the Ivory Gull to reappear. Over the past two days it has begun spreading out around the harbor, spending less and less time near the lighthouse parking lot. No big deal...there were plenty of gulls coming and going, including a nice first-cycle THAYER'S GULL (pics to be posted soon). But when the bird was there, it put on a freakin show. More pics and video to come. Close views in nice light revealed the bill to be beautifully colored - a blue-green base and a yellow tip with a hint of orange. Kim doing her best polar bear impression, to make the bird feel at home. A view of the bird's favorite cove from this morning. 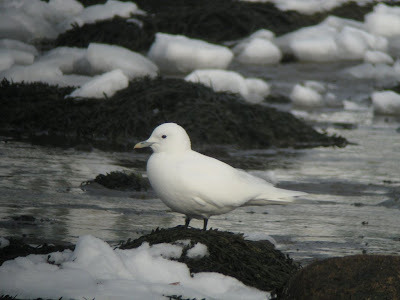 I had the chance to see the Ivory Gull in New York two years ago. You are right--photos cannot really do it justice. I have seen lots of snow, swans, clouds, cotton, sea foam, etc. 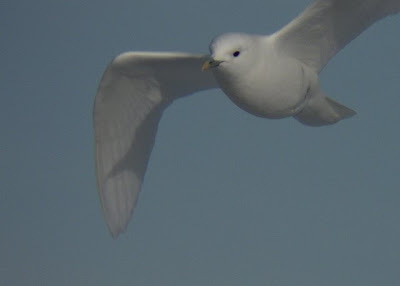 etc., but the pure whiteness of an adult Ivory Gull has to be seen to be believed. In the language of the Bible, "so as no fuller on earth can white them." You were able to get some great pictures! I've had a lot of good luck in the past along the North Shore. (Thank goodness for GPS or else I would have ended up in Pennsylvania!) I also started making great playlists with some of my favorite new music to play on my iPod. It definitely helps kill the time. Hope to see some more great pictures as the warm, spring weather approaches. Good luck!